What is a Viking without a ship? With that perhaps provocative question, I would like to introduce the topic of this paper: communicating the past through carpentry and art in cultural heritage institutions. Although the main purpose(s) or goals of these organizations vary, museums in particular can be seen as receptacles of past lives. For instance, they contain historical artefacts, and often documents, keys and doorways to the past. In addition, they create and preserve narratives of the past, presenting and interpreting them for their visitors. Among these cultural heritage institutions are those most concerned with maritime cultures and their ships, as well as specific time periods such as the Viking Age, Indeed, in narratives about the Viking age, the ship is often incorporated as an important element. Again, What is a Viking without a ship? This paper discusses the role of the ship in communicating and interpreting the past, in this case the Viking age, by comparing one museum and one “experience centre”: the Viking Ship Museum in Roskilde and the Ribe Viking Centre. The paper is based on my study of a number of museums and centres throughout Scandinavia. These two case studies have been chosen as they are both found in the same country, Denmark, and represent these two approaches to engaging visitors in learning about the Viking Age. Together, they combine several of the themes of the conference at which this paper was originally presented: re-creation and academic methods. Before presenting and discussing the two museums, it is necessary to discuss the multiple roles of the museum, the role of experimental archaeology, and the reason that ships can be seen as cultural objects from which historical narratives can be spun. As mentioned, this paper discusses two different types of “museum” or what the public perceives of as museums: the “traditional” museum and the experience centre. 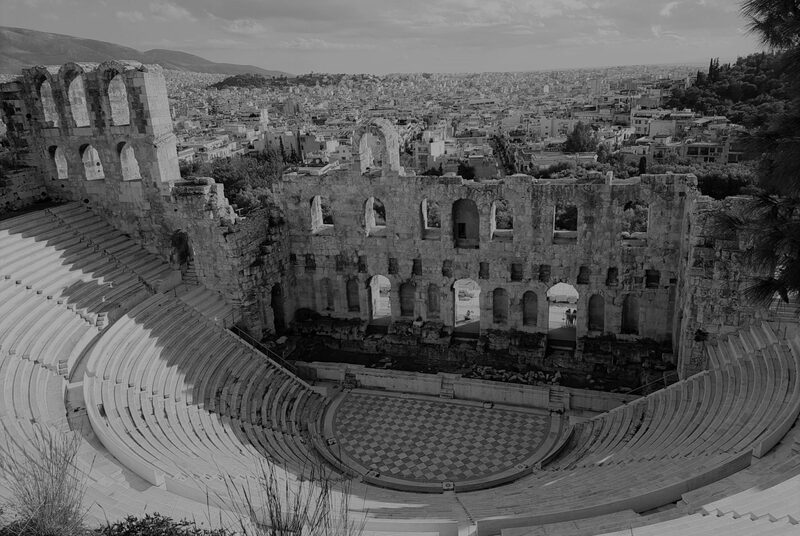 What role do these types of cultural heritage institutions play in interpreting and communicating the past? First, a traditional museum is usually a public institution with a directive, expressing its specific focus and purpose. Traditional museums, however, have many roles in common that might not be specifically articulated in their individual mission statements. In general, museums are instrumental in the interpretation and communication of historical narratives. They provide an authoritative voice, conserve objects/knowledge, and (possibly) provide some form of entertainment to their visitors. Second, the relative newcomers to the scene are the experience centres. Their role is also found in communication and interpretation, but there is a heavy emphasis on entertainment. They can be described as the “Disney Land” of history. Until recently, many of these centres were viewed with mistrust but are now becoming accepted as mainstream. In some cases, their goals were primarily focused on entertainment and the communication of specific aspects of history, not the entire picture. In experience centres, the consumption of history by visitors is the most important part of the concept. Enabling a visitor to experience history using (nearly) all of their senses is of primary concern. Here, it is important that you are allowed, even encouraged, to put yourself in the shoes of someone in the past. Although they may not think that they have this role, the public and especially their visitors see them as having authority. In both instances, especially where the experience centres have access to actual finds, there are some common aspects to consider. One of these – important to the current study – is the use of objects as gateways to historical narratives. Using material objects to make history come alive for the interested public includes archaeological finds/objects and their reconstructions. How is this done and on what basis? One of the ways is through re-creations and reconstructions, which allow the public to touch and experience history using all of their senses. Re-creations and reconstructions are important elements in experiencing history and in what has come to be called the consumption of history (De Groot 2016). They make history come alive and infuse it with a feeling of relevance to the interested public. Added to this is the fact that one of the most important foundations in reconstructing historical objects is found in experimental archaeology. Of course, experimental archaeology can be applied to practically any find. Indeed, a numerous categories of artefacts are the focus of reconstruction work. In my study, I have chosen ships as an artefact category worthy of further study due to their long-term significance in Viking-Age narratives. An integral part in reconstruction work – at least on the scientific or scholarly level – is experimental archaeology. The development of this discipline has been vital to understanding how reconstructions should be done. At this point, it is important to highlight a difference in terminology. Reconstructions are attempts to re-create an actual, sometimes incomplete find; at times, these are inspired by finds but are not attempts to re-create an actual find (here called re-creations). Neither of these is a restoration of an actual find. Experimental archaeology can be concerned with all of these and should always follow certain procedures – if it is to be done correctly. If not, those who subscribe to the following process could deem the reconstruction suspect and not to be trusted in the interpretation of the use or history of a historical item, including its use in the historical period in question. There needs to be an archaeological basis for the reconstruction or copy of a find. A research strategy needs to be in place. What is the potential for this find? What can a reconstruction or copy tell us about the object in question, its place in the historical narrative, its use in the past, etc. Original material has to be used. In addition to the material of the actual object, this point includes the tools used to reconstruct the object. Knowledgeable and competent craftspeople and end-users are needed in order to properly reconstruct the object and then use it! Results must be published and documented so that they can be tested or attempted again. As seen, the above principles are based on the scientific method. They also, perhaps inadvertently, require an interdisciplinary or multidisciplinary approach (cf. Petersson 2003). In addition to archaeologists, craft specialists and users of the item are also required in order to come to valid conclusions. Often these are one and the same, however. In the case of this study, experienced boat-builders and sailors are necessary for the successful completion of a project. As mentioned, the reliance on scientific principles – concrete, replicable steps – and use of material culture creates the assumption that this experimental method is objective and inherently source-critical. However, the goal of pure objectivity is unattainable. The subjective aspects of interpretation and the emotional aspects of reconstruction cannot be avoided. It is impossible to be positivist and deny emotions when humans and interpretation are at the centre of the reconstruction work. Thus, as Petersson also states, it is vital to be aware of the humanistic view inherent in this type of work (2003). A sense of principles and guidelines are very important in reconstruction, and it seems that most agree that especially points 1, 2, 4, and (to some extent) 5 should be upheld in all forms of reconstruction. However, there is not always consensus about point 3. This principle can create difficulties in terms of the availability of the appropriate material, the cost, and the (in-)experience of the craftsperson. Original material is useful if required to test a certain hypothesis, but it is not always practical. This sense of practicality and willingness to be flexible seems mainly evident at the experience centres. It could be speculated that this approach is also valuable. As has become clear from my ongoing study, those engaged in reconstruction work all expressed a sense of enjoyment that they experienced in the process of building and creating. Thus, the humanistic element is clearly manifest in reconstruction work. The general consensus was: It might be hard work – but it is lots of fun! 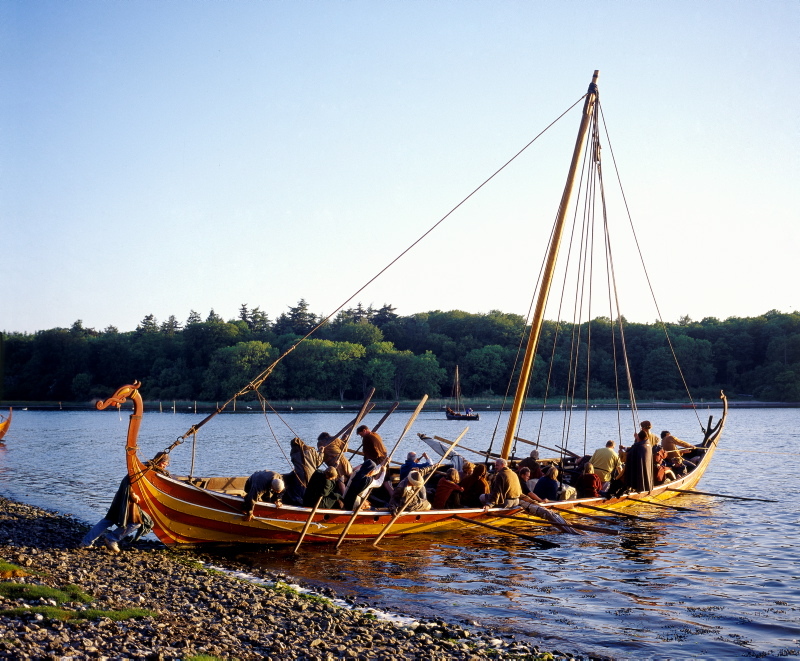 Throughout history, including during the Viking Age, ships have played an important societal role. Waterways and the ships or boats that travelled them have enabled social communication by providing a foundation of communication and trade networks. In the Viking Age, they were associated with an increase in mobility – imagined or otherwise. The latter ensured access to, sometimes vital, provisions and even luxury goods. In addition to their very important practical functions in the Iron Age, ships were a symbol of power, both secular and religious. The importance of the ship as a symbol could vary however based on local and familial traditions. For instance, in some areas, ship burial was more common, while in others votive offerings of ships in graves was the preferred practice (e.g. Larsson 2007; Westerdahl 2007). Thus, as artefacts ships are imbued with the potential to evoke images of the past and, for this reason, are ideal to use in the concretization of historical narratives. Ships are a relatively common feature in art from the period, including on the picture stones. These representations show forms of decoration on the ships, such as animal heads. Indeed, many of the ship finds have some form of decoration on them, although most are not as elaborately decorated as the Oseberg (img. 1). In other words, it seems that some sort of decoration was integrated into and important in the construction of most ships. Occasionally that ornamentation is graffiti, which might be identified as an important element in the academic analyses of ship finds. However, as will be discussed, this ornamentation – whether original or later graffiti – is not always thought of as an integral aspect in the reconstruction of the ship. More focus is given to the structure and practical function of the ship – ensuring that the final result is a fully functioning vessel. The question of re-creating ornamentation is often left to last. Why is art separated from the ship-building process? Why does it remain an afterthought? In the next sections, I will discuss the two case studies and explore these questions. The museum which best fits the traditional museum category is the Viking Ship Museum (VSM) in Roskilde. However, it is not only a traditional museum with a permanent exhibition. It is in fact a unique combination of a traditional museum and a “living museum” (Roskilde 2017); the latter is something like an experience centre. In the main hall, built especially for this purpose, the permanent exhibition of the five Skuldelev wrecks is situated. These wrecks were excavated from their resting place as a barrier in Roskilde Fjord, conserved and reassembled in the museum. Iron ribs were used for the missing sections to show the way the boat might have looked. The museum was designed and built so that the visitor feels that they are on the water. The main purpose of the museum is the interpretation of the Viking Age. An important part of the museum’s purpose and mission is found in its pedagogical activities. There is an especial focus on school-children and pedagogy together with Skoletjenesten. For instance, the permanent exhibition has a section with a “boat” in which children can explore (or play in). Children can also dress-up in Viking clothes and pretend that they are about to embark on a voyage. Part of the museum’s reconstruction work can be seen in the hall. The weaver sits in one corner and the partially woven sail is always on display. Connections to the scientific method in the form of marine archaeology exhibitions are also found in the main building; however, these are not a part of the main ship hall. The living museum aspect is found in the small boat harbour and adjoining workshops. Similar to an experience centre, occupations associated with the Viking Age have been placed here. In this case, all of those professions needed in order to make true reconstructions (except for the sail) are found here: a rope maker, a smith, boat builders, and carpenters. These craftspeople are all expected to be true to Viking age techniques by using reconstructed tools in their work – clearly adhering to reconstruction principles 3 and 4. In the harbour, all of the ships are docked for most of the year, except for the winter when they are taken up on land. 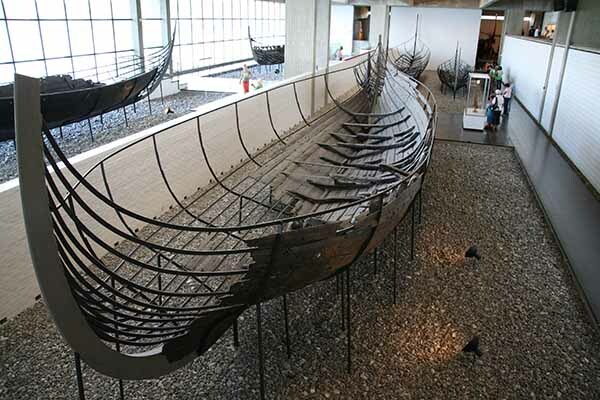 A visitor will find reconstructions of the Skuldelev ships in the harbour, but there are also other reconstructions. 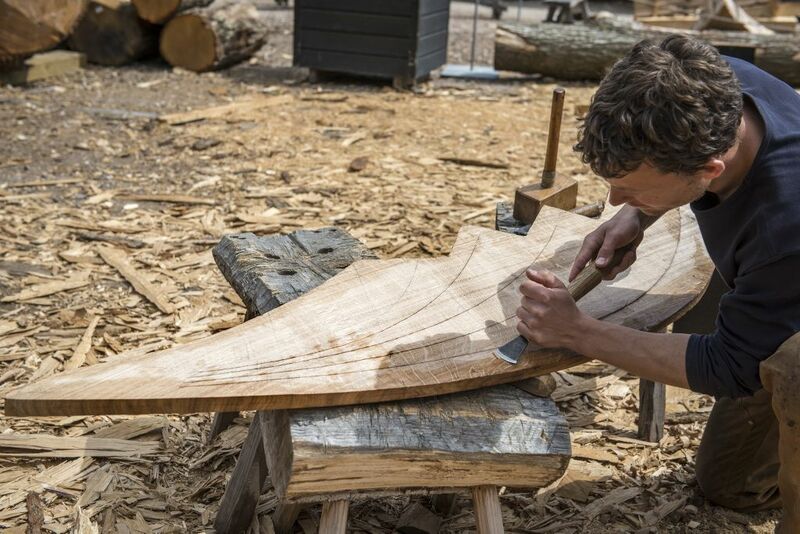 The boatyard’s mission statement includes reconstructions and care for all clinker-built and historical wooden boats from the Viking Age to more recent models. The Viking Age reconstructions include, for example: Havhingsten (the Sea Stallion) which is a reconstruction of Skuldelev 2, as well as Helge Ask (Skuldelev 5), and Kraka Fyr and Skoldjungen – two different interpretations of Skuldelev 6 (Roskilde 2017). How then are these artefacts and their reconstructions used to communicate the past at the VSM? In the main hall, the exhibit is static with signs and statistics related to the ships, which includes some information explaining the reconstructions found in the harbour and small models of these ships. The visitor is encouraged to read, to observe, or to ponder. There is also the option of going on a guided tour in which the artefacts are given a context. This is done by identifying where, when and how the artefact was made, but a narrative based on the lifetime of the ship AFTER its construction is also provided. Both types of biography are applied interchangeably. In addition to the re-built ships (and the children’s ship corner), there are two other exhibitions which make use of the ship as an artefact in creating narratives about the past. One features an explanation of the attack on Roskilde and the creation of the barrier further up the fjord. In this case, the afterlife of the ships is in focus. They are used to weave a tale about political power, military tactics, and the rise of the city. Another way in which the artefacts are used is related to their reconstruction. Reconstructions are built based on the above experimental archaeology principles. Exposing visitors to these and to the process of creating a new artefact (based on an actual, historical find) creates an encounter with a (re-created) past phenomenon and enables historical empathy – in this case for shipbuilding. As a result, visitors are encouraged to participate in and try their hand at all of the activities in the living history section – not unlike visiting an experience centre. Otherwise, this living-history area also provides a passive viewer experience, where visitors can watch the experts at work making rope, smithing, chopping boards, and so on. As an example of some of the recent work at the museum – in terms of using craftsmanship to communicate history – I would like to mention the Gislinge Boat Project. This project was originally planned to take place from 2015-2016 but is now an open-source project on the museum’s website (Roskilde 2016). The boat find in question is from the 12th century (so not really the Viking age!). However, it can serve as a prime example of one of the ways in which the museum works to engage the public in its ongoing reconstruction activities. In this project, the interested public were invited to join the experts for workshops, for example, to cleave boards, produce nails and rope, and weave the sail. In other words, they contributed to the actual reconstruction of a clinker-built ship. The museum aimed to provide hands-on experience to bring visitors closer to the past. Diagrams and schematics were even made available open-source so that others could also build their own reconstructions. Imagine building your own medieval boat! If you would like to test it, the diagrams are still available. A virtual community has also been created around the project with film and photo updates. What about the artwork or ornamentation on the ships? In the main hall, any discussion on the artwork is made in passing. A discussion of Viking age art is relegated to a series of posters, which present an overview of the Viking Age. There is, of course, an awareness at the museum that these need to be updated. In addition to these posters, there is also, for example, a re-created metal weathervane (as seen on the Havhingsten) on display on the wall with a small text. Ornamentation on the ships is not highlighted however, even though Skuldelev 5 is partially decorated. The same is the case in the harbour: the ship’s function is the primary focus. Indeed, ornamentation is often not included in the initial planning of the reconstruction process. Building a sound boat is the primary focus, which is definitely understandable! Art is left to last, but that does not mean it is entirely forgotten by the craftspeople, including the ship-builders. They do ask the following questions: How should we paint the boat? Should we decorate the stems with an animal head (or a windvane)? Indeed, both Helge Ask (img. 5) and Havhingsten (img. 4) have prow decorations, the former with an animal head and tail (only when at sea, fitting with the sagas) and the latter with a golden windvane (Roskilde 2015). Skuldelev 5 has a tendril/vine or a snakehead carved into its side. This ornamentation was in fact reconstructed by painting a copy of the figure on Helge Ask (Roskilde 2015). Moreover, both of these longships have been brightly painted in red and yellow (and blue in the case of Havhingsten). However, this aspect of reconstruction is not represented among the different occupations or trades represented in the workshops. Art is an still an afterthought in the communication of the history surrounding these artefacts. Turning now to the other cultural heritage institution: the experience centre. In this case, Ribe Viking Centre (RVC) is a private company that cooperates with local and regional museums, in particular the Museums of Southeast Jutland, Museet Ribes Vikingar, as well as the VSM in Roskilde. In addition, RVC also cooperates with the municipality in terms of their pedagogical work together with Skoletjenesten (roughly “school service”) for pupils in compulsory school, as well as their collaboration with the local “production school” Lustrupholm (Danish: produktionsskolan). Among other things, these young people at the production school participate in construction and re-construction at the site, and work with the public during the summer months (Ribe 2013). The concept of RVC is founded on a vision of bringing the Viking Age to life. The time period is broad while the geographical scope is narrow: approximately the 700s to the 900s in the Viking age market town of Ribe and on a nearby manor farm on Jutland. Thus, in particular, the RVC aims to “bring to life” the Viking-Age town and surroundings of Ribe (RVC 2017b). The town itself is (and was) situated about 3 km to the north of the experience centre. Visitors to the RVC are given the chance to experience history first hand, to step back in time. When the centre is open to the public, the site is populated by re-enactors and guides (in period clothing). In addition to the regular, daily activities, there are always several, larger reconstruction projects on the go at the centre. Among these projects is boat-building which takes place in the centre’s rudimentary shipyard. There are also several boats floating in the man-made lake (which is meant to represent Ribe’s harbour), docked by the re-constructed harbour (an interpretation of the find from Hedeby, not Ribe!). As at the VSM in Roskilde, the boats are also taken up on land in the winter. 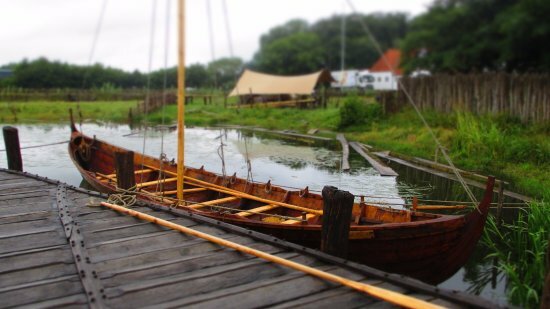 Contrary to the VSM in Roskilde, ships are a part of a much larger whole at the RVC: the re-creation of Ribe in the Viking Age. This re-creation is done by establishing stations or areas run by craft specialists (or religious specialists) who practice their craft and encourage visitors to engage in hands-on activities. The hands-on aspect is a similar technique to that used in Roskilde. In its daily routine, the centre thus also subscribes to experimental archaeology principle 4, but as will be seen, number 3 is not always applied. All of the principles are applied when cooperating on experimental archaeology projects together with, for example, the VSM in Roskilde – as was the case with Gísla (see below). However, the centre’s main mandate is enabling their visitors to experience the Viking Age, not subscribing to scientific principles. As mentioned, boats feature as one of the crafting-stations at the RVC. Again, the question could be asked: what is a viking without a ship? In re-creating a historical situation, and especially that of a market town, ships are seen as a necessary feature. As mentioned, he RVC contains a (rudimentary) shipyard with a carpenter, although this individual is usually not a boat-building specialist. The two boats by the reconstructed harbour provide a prime example of the flexibility within which this centre works. One of the boats (not pictured) is a reconstruction of a find from Gislinge (Lammefjord) called Gísla. As mentioned it was built together with the VSM in Roskilde, incorporating the five principles of reconstruction within experimental archaeology mentioned above. The other (img. 7) boat, named Kajs kærling, is more representative of how the centre usually works. Kajs kærling is clinker-built but it is not based on a specific find (in contrast to principle 1 above). However, the re-creation is inspired by Viking Age finds and fits into the intended historical context well. Its name contains an inside joke as the word kærling refers to a “hysterical woman”, and connects it to its builder, Kaj. All of the boats constructed in the boat-yard at RVC are built within a limited time-frame, under pressure. Perhaps this inspired the choice of name? This boat has been decorated with grooves and human heads on some of the pins, in addition to having its name on the prow. In order for the shipyard at RVC to be a hub of activity like the other areas of the centre, a ship needs to be always on the go. Often, as with their other larger (re-)construction projects, there is also a deadline to meet, i.e. when the boat needs to be completed. These constraints lead to a certain pragmatism on the part of the carpenters. 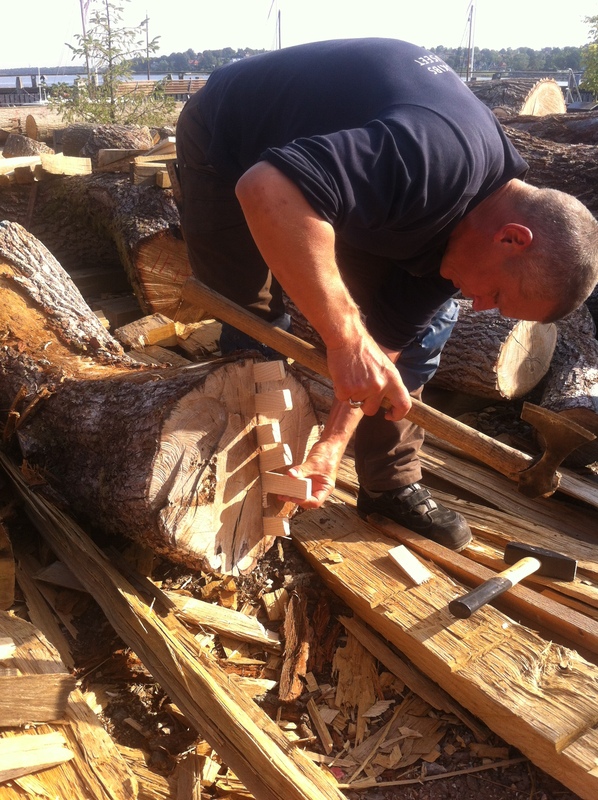 Thus, for example, modern tools (hidden from the view of visitors) are used if necessary and planks are sawed not hewn. It is more important to meet the deadline than to follow the principles of reconstruction. In addition to these challenges, the carpenters are required to explain the building process to the visitors, and much of their time during the day is focused on these interactions. Although visitors are welcome to participate in many of the other crafting activities on site, in this case, visitors are not allowed to work on the ship. They do interact with the carpenter by asking questions, as mentioned, or perhaps they are given a tool to hold. At the RVC, communicating the Viking Age via craftsmanship is clearly import. Art is found in many places – including on the newly (re-)constructed “Ansgar’s Church” – but again, it is not explicitly discussed in relation to ships. The carpenter at RVC insisted that decoration was something that you could make if there was some free time after finishing a boat. The ornamentation that is found on Kajs kaerling was carved during a moment of inspiration and when the carpenters had some spare time. There was no way of knowing if they would decorate the new boat under construction in the harbour, but perhaps if they got ahead of schedule there would be time for inspiration. At the RVC, as at the VSM in Roskilde, boats are found in their proper, watery context. However, here the lake is man-made and rather small! Despite this fact, if you were not looking to learn more about ships, you could miss them entirely, especially the ones docked in the harbour. It is highly likely that their role in the entire context of the centre would be unclear to the average visitor – before they ask, at least. What, then, is a Viking without a ship? At the two cultural heritage centres presented in this paper, it is apparent that ships are important artefacts, used in the production of narratives about the Viking Age. They are given different prominence of place, of course, based on the institutional mission statement in question. At the museum featured in this paper, VSM in Roskilde, ships are given a prominent position. This approach is of course due to the purpose of the museum – to display actual ship finds and educate the public about these particular ships. The next step, building a living history component to the museum, and using experimental archaeology and reconstruction in the education of the Viking period, could have been broadened to include more than just ships. However, the museum maintains their focus on the ship as the most important artefact in the interpretation of the Viking Age and its various (common?) occupations. At the experience centre in this paper, RVC, the shipyard might be tucked away on the other side of the man-made lake from the re-constructed dock, but it is still an important feature. The role of the ship-builder is added to a list of craftspeople that work at the centre, playing a vital role in the interpretation of the Viking Age – one of the pieces of the puzzle. However, this puzzle piece could be missed in the plethora of options available for the visitor. This last point can be directly connected to the fact that the RVC, as with the VSM, encourages visitors to return. You should be able to experience new things on each and every visit. At both sites, the art of, or carpentry involved in boat-building is separated from the creation of ornamentation. The focus is on creating a sea-worthy craft – something, of course, entirely understandable! The interesting thing here is the separation of the practical and the decorative functions in the presentation of shipbuilding to the public, as well as in the actual planning of the building of a ship. This separation leads to a somewhat disjointed narrative and process of reconstruction. Regarding the ships discussed in this paper, some of the original finds at the VSM in Roskilde do include ornamentation. In turn, two of the reconstructions at the VSM are painted in bright colours and feature prow ornamentation. A visitor can engage the museum interpreters/guides in a conversation about these features if they are curious. In addition, over in Ribe, one of the boats at the RVC is partially decorated. However, at both places, the main narrative is that this particular artefact, the boat or ship, is a practical tool. 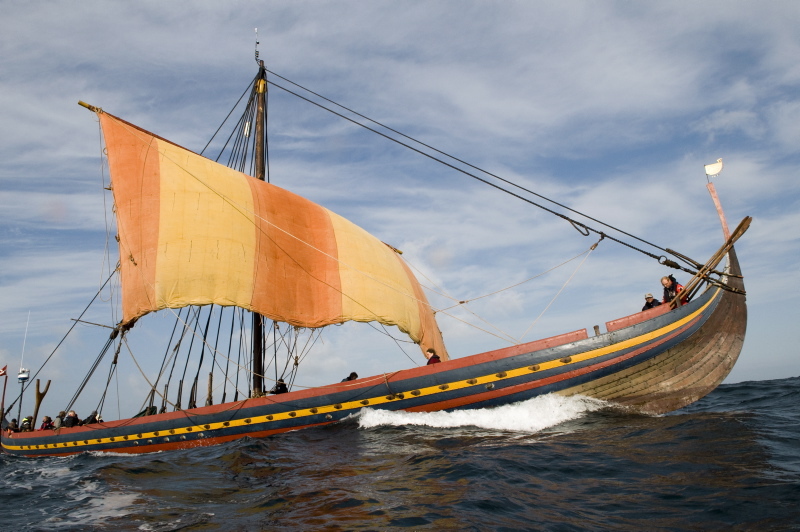 The focus is on its function in Viking-Age society, and as a working vessel. The above paper is a work in progress. It discusses just two of the many museums and experience centres throughout Scandinavia that focus on the Viking Age; many of these are included in my ongoing study. In general, based on the observations gathered so far, it appears that a ship/boat is required in order to construct narratives about the Viking Age. Even questions of skilled craftsmanship can be linked to ships. The way in which these diverse cultural heritage centres work with artefacts, and in particular reconstructions, as a means of communicating history is worth exploring further. Interview with Anne C. Sørensen, Vikingeskibsmuseet, Roskilde, Danmark: 2016-11-17. Interview with Bjarne Clement, Ribe VikingeCenter, Ribe, Danmark: 2017-08-13. Berkhofer, Robert F. 2013. Fashioning History: Current Practices and Principles. New York: Palgrave Macmillan. Bischoff, Vibeke, Englert, Anton, Nielsen, Søren och Ravn, Morten 2014. ”From Ship-Find to Sea-Going Reconstruction. Experimental Maritime Archeology at the Viking Ship Museum in Roskilde”, in Jodi Reeves Flores & Roeland Paardekooper (ed. ), Experiments Past. Histories of Experimental Archaeology. Leiden: Sidestone Press, pp. 233-247. Christensen, Arne Emil 1995. ”Ship Graffiti”, in Ole Crumlin-Pedersen & Birgitte Munch Thye (ed.). The Ship as Symbol in Prehistoric and Medieval Scandinavia. Papers from an International Research Seminar at the Danish National Museum, Copenhagen, May 5-7, 1994. PNM Publications from the National Museum, Studies in Archaeology and History, Vol. I. Copenhagen: National Museum of Denmark, pp. 181-185. De Groot, Jerome 2016. Consuming History: Historians and Heritage in Contemporary Popular Culture. London: Routledge. Larsson, Gunilla 2007. Ship and Society: Maritime Ideology in Late Iron Age Sweden. Uppsala: Archaeology, Uppsala University. Le Bon, Liz 1995. ”Graffiti: Symbol and Context”, in Ole Crumlin-Pedersen och Birgitte Munch Thye (ed.). The Ship as Symbol in Prehistoric and Medieval Scandinavia. Papers from an International Research Seminar at the Danish National Museum, Copenhagen, May 5-7, 1994. PNM Publications from the National Museum, Studies in Archaeology and History, Vol. I. Copenhagen: National Museum of Denmark, pp. 172-180. Legnér, Mattias 2016. “Kulturarvsbruk i väpnade konflikter”, Historisk tidskrift 2016:4, pp. 658-672. Petersson, Bodil 2003. Föreställningar om det förflutna. Arkeologi och rekonstruktion. Lund: Nordic Academic Press. Ribe Viking Centre (RVC) 2017. Vikingebådene, http://www.ribevikingecenter.dk/da/oplevelser/vikingebaadene.aspx. Accessed: 12 July 2017. Ribe Viking Centre (RVC) 2017b. Historien bag. Levendegørelse av vikingetidens Ribe. https://www.ribevikingecenter.dk/da/om-os/historien-bag.aspx. Accessed: 15 September 2018. Ribe Viking Centre (RVC) 2013. Lustrupholm. https://lustrupholm.dk/skolen/lustrupholm.aspx. Accessed: 12 February 2019. Viking Ship Museum in Roskilde (Roskilde) 2017. Experimental archaeology. http://www.vikingeskibsmuseet.dk/en/professions/research/experimental-archaeology/ Accessed: 12 July 2017. Viking Ship Museum in Roskilde (Roskilde) 2015. Bådeværftets byggeliste. https://www.vikingeskibsmuseet.dk/fagligt/baadevaerft/baadevaerftets-byggeliste/. Accessed: 12 February 2019. Viking Ship Museum in Roskilde (Roskilde) 2016. Gislinge Boat Open Source Project. 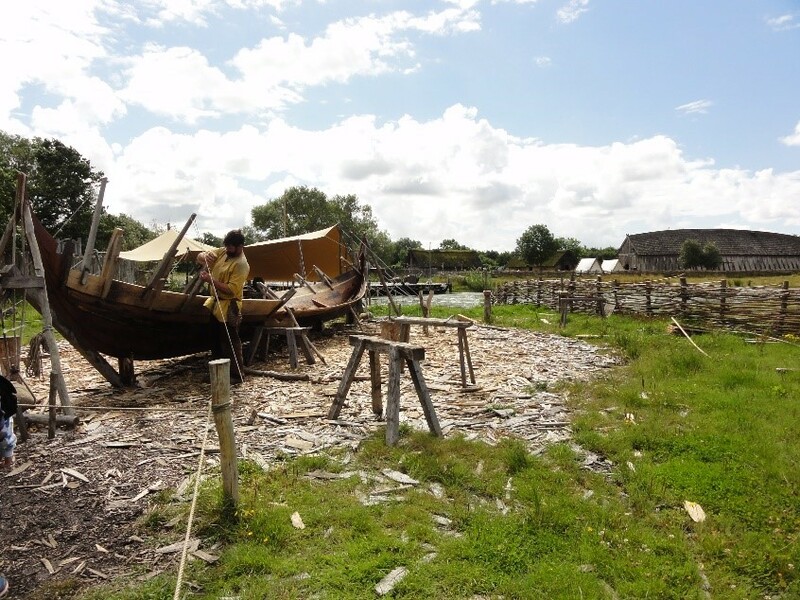 https://www.vikingeskibsmuseet.dk/en/professions/boatyard/building-projects/gislingeboat-2016/open-source-project/ Accessed: 10 September 2018. Vinner, Max 2001. Vikingeskibsmuseets både. Roskilde: Vikingeskibsmuseet. Westerdahl, Christer 2007. “Boats Apart. Building and Equipping an Iron-Age and Early-Medieval Ship in Northern Europe”, The International Journal of Nautical Archaeology. Published: 23 October 2007. DOI: 10.1111/j.1095-9270.2007.00170.x Accessed: 28 November 2017. Those youths attending a Danish “production school” have, for one reason or another, previously been unable to complete their secondary education. They are all under the age of 25. The practice of choosing names when christening boats deserves its own, separate discussion! In order to be a proper reconstruction, they should be hewn, as is done at the VSM in Roskilde. The carpenter contributed in part to the Interview with Clement, 2017-08-13. The boat is now finished but does not appear to have been decorated yet – at least as far as I could see from a quick observations on my last visit to RVC in December 2018. Previous PostPrevious Part 2: What Colour a God’s Eyes?